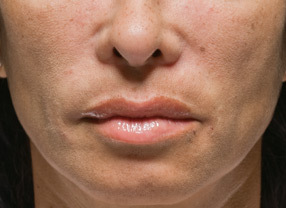 For most of us, smile lines — also known as nasolabial folds — are nothing to smile about. 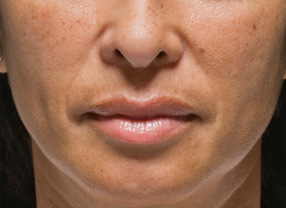 These lines and creases run from the side of the nose to the corner of the mouth, and get deeper as we age and lose facial volume. 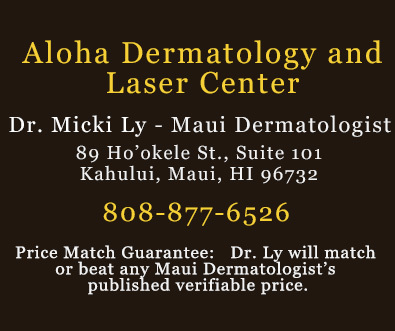 They can make you look older, tired, or unhappy — even though you feel young and vibrant. Fortunately for the young at heart, treatment with RADIESSE® wrinkle filler can bring back youthful volume and stimulate collagen production in this area, with results that may last a year or more in many patients. In just one syringe, many patients can achieve long-lasting youthful results. Because treatment with RADIESSE® wrinkle filler is simple, quick, comfortable and convenient, with immediately visible results that last, more and more people are discovering that it is the natural choice for maintaining a more youthful appearance. Before Radiesse Treatment for "Smile Lines"
The ideal way to achieve wrinkle reduction is by replenishing lost volume. With RADIESSE® wrinkle filler, you welcome back your own natural collagen to smooth out the signs of aging. That's because RADIESSE® wrinkle filler's unique formulation stimulates collagenesis  the production of new collagen  which results in increased volume for natural looking wrinkle correction that may last a year or more in many patients. It's also why more and more cosmetic surgeons, estheticians, and other medical professionals are choosing RADIESSE® wrinkle filler for long-lasting facial rejuvenation.